Increasingly, government and environment news sources are celebrating the growth of renewable energy. See, for example, Renewables Beat Fossil Fuels Second Year in a Row. If only transition to a sustainable future were as simple as switching from fossil fuels to renewables. The harsh reality, as Canadian ecologist William Rees details in his article below, is that the great transition to “a more economically secure, ecologically stable, and socially equitable future” is a formidable challenge. For starters, humans have never lived sustainably. The outcome is not certain. In his article, an abridged, modified version of which appears below, Rees outlines the essential steps on a path to Survival 2100. To read the original, full article, click on the following linked title. 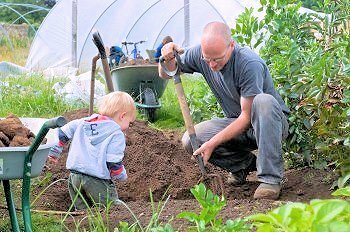 A man and child garden in Ireland’s first ecovillage. The village aims to be self-sufficient in food, with residents growing their own fruit and vegetables. Rees’ Survival 2100 plan calls for the continued pursuit of local resilience and the diversification of local economies. One might think that humanity’s best science would be enough to stimulate a decisive policy response, but the feeble effort so far has done little to stem the cumulative cascade of dismal data. No national government, no prominent international agency, no corporate leader anywhere has begun to advocate in public, let alone implement, the kind of evidence-based, visionary, morally coherent policy responses that are called forth by the best science available today. As noted above, despite decades of hardening evidence, mainstream global society nevertheless remains in policy paralysis, stymied by cognitive and behavioral barriers to change that have deep roots in both human nature and global society’s culturally constructed economic growth fetish. But what if mounting public pressure (think Occupy Wall Street) or a series of miniclimate catastrophes finally overwhelms these barriers? Assume the world community becomes fully motivated to deal effectively with biophysical reality. Now the question becomes: What would truly intelligent, forward-thinking, morally compassionate individuals do in response to available data, the historical record, and ongoing trends? (d) that this is good—it means that the model can be deconstructed, analyzed, and replaced. In effect, the metagoal of Survival 2100 would be to rewrite global society’s cultural narrative to achieve greater social equity and economic security in ways that reflect biophysical reality. The Survival 2100 plan would call for new job-training and job-placement programs for employment in emerging “sunrise” industries such as solar energy. Clearly the economic policy emphasis would have to shift from efficiency and quantitative growth (getting bigger faster) toward equity and qualitative development (getting truly better). Indeed, the steady-state economy would be a smaller economy. Eliminating overshoot requires a 50 percent reduction in global fossil energy and material throughput. And to address egregious inequity, wealthy countries will have to reduce their consumption by up to 80 percent to create the ecological space necessary for justifiable growth in developing countries. 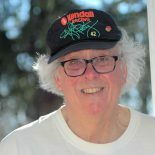 Implementing an equity-oriented planned economic contraction in turn requires that the underpinning values of society shift from competitive individualism, greed, and narrow self-interest—all sanctioned by the prevailing narrative—toward community, cooperation, and our common interest in surviving with dignity. The emotive rationale for such a developmental about-face is captured in the last phrase above. Global change is a collective problem requiring collective solutions. Individual actions produce inadequate, even trivial improvements; no individual, no region, no country can succeed on its own. Perhaps for the first time in history, individual and national interests have converged with the collective interests of humankind. Governments and international organizations must therefore work with ordinary citizens to devise and implement policies that serve the common good on both national and global levels. Evidence abounds that failure to act in ways that reflect humanity’s shared interest in survival with dignity will ultimately lead to civil insurrection, geopolitical tension, resource wars, and ecological implosion. 7/ Sustainable society will cultivate investment and conserver values over spending and consumption. One thing that has passed its “best before” date is the contemporary cult of consumerism. The material ethic is spiritually empty and ecologically destructive. A sustainable society, by contrast, will cultivate investment and conserver values over spending and consumption. A sustainable conserver society would also abandon predatory capitalism with its unbridled confidence in markets as the wellspring and arbiter of all social value. Unsustainability is quintessential market failure. Society must relegitimize public planning at all levels of government. We need selective reregulation and comprehensive extramarket adaptation strategies for global change. A necessary first step would be to acknowledge that globalization encourages the externalization of ecological and social costs (think climate change). Many goods and services are therefore underpriced in the marketplace and thus overconsumed. As any good economist will acknowledge, government intervention is legitimate and necessary to correct for gross market failure. Indeed, resistance to reform makes hypocrites of those who otherwise tout the virtues of market economies. Truly efficient markets require the internalization of heretofore hidden costs so that prices tell consumers the truth. tie development policy to the “strong sustainability” criterion (i.e., maintain constant, adequate per capita stocks of critical natural, manufactured, and human capital assets in separate accounts). replace or supplement gross domestic product with more comprehensive measures of human well-being. 12/ Survival 2100 calls for investment in rebuilding local/regional natural capital stocks such as fisheries. The U.S. sea scallop fishery is the largest wild scallop fishery in the world. In 2009, U.S. fishermen harvested 58 million pounds of sea scallop worth more than $382 million. Survival 2100 calls for investment in rebuilding local/regional natural capital stocks such as fisheries. invest in rebuilding local/regional natural capital stocks (e.g., fisheries, forests, soils, biodiversity reserves, etc.) using revenues collected from carbon taxes or resource quota auctions. implementing state-assisted family-planning programs everywhere to stabilize/reduce human populations. Conclusions: Can Survival 2100 Fly? The forgoing is only an introduction to the kinds of policies implicit in a Survival 2100–type project, but it is sufficient to show that sustainability does, indeed, demand what many scientists (and even politicians) have been asserting for decades. We are engaged in a genuine paradigm shift—the abandonment of the beliefs, values, assumptions, and behaviors underpinning the status quo and their replacement by an alternative development paradigm. The good news, of course, is that the alternative offers a more economically secure, ecologically stable, and socially equitable future for all than does staying our present course. The bad news is that there will be strident resistance from those with the greatest stake in the status quo, from people who reject global change science, from extreme libertarians, from those who worship at the altar of the marketplace, and from anyone who regards regulation and government—particularly in the international arena—as the spawn of the devil (e.g., factions of the U.S. Republican and Tea Parties who “repudiate sustainable development and describe the global effort to achieve it as ‘destructive and insidious’” and who regard UN agencies and various NGOs as anti-American conspiracies). More generally, planned economic contraction hardly resonates with the times. Indeed, if the basic science of global change is correct, resistance to change may well be the greatest threat to the future of global civilization and overcoming it a more difficult task than implementing the transformation itself. And failure is possible. As anthropologist Joseph Tainter reminds us, the most intriguing thing about complex societies is the frequency with which their ascent to greatness is interrupted by collapse. Collapse on a global scale, however, would be unprecedented. Should H. sapiens fail in efforts to implement something like Survival 2100, evolution’s great experiment with self-conscious intelligence will have finally succumbed to more primitive emotions and survival instincts abetted by cognitive dissonance, collective denial, and global political inertia. But if we succeed … !! This entry was posted on April 24, 2015 by fjwhite in counterpower of one, evidence based counterpower, leadership, resiliency, scientist's counterpower, sustainability and tagged barriers to climate change action, collapse, effective action, relocalizing the economy, William Rees.